This entry was posted in Cherry Car, Service Cost and Quality, Transit. Bookmark the permalink. ← Is the TTC Really Number One? Have the automated greasers been activated on the 514 Flexities? Did I understand they are GPS activated? If so, that should be interesting given how the TTC’s fleet is prone to GPS errors. I hope that at the meeting someone explained decibels and frequency in terms of human hearing. In an understandable way. And that the public cared to understand. A difference of 10 decibels is a ten-fold change in power, so going from 80dB to 70dB implies that the acoustic energy is now 10% of what it was. Physiologically it won’t sound one-tenth as loud, though. I don’t envy the PR or scientific people that the TTC would send to a meeting like this. I don’t envy the east-end folks who have to put up with yet another slow order and unreliable service either. Steve: The explanation focused on the fact that the high hertz values are the annoying squeal, not on the relative meaning of the change in values besides saying “look there is a big change”. The scientific folks were there but never spoke. It was not a well-organized presentation. The former King Barns site now has a brand new TCHC building on it, so no remnants of anything. 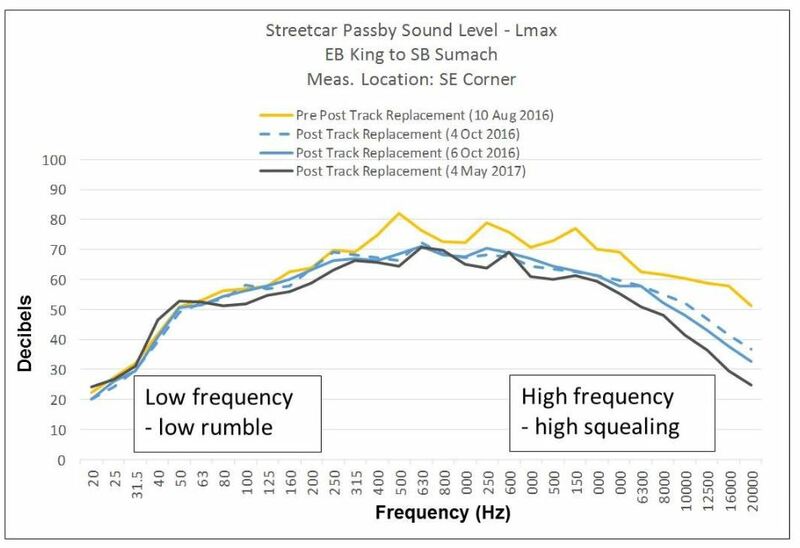 From the presentation it appears that they are keeping the speed limit on King Street through the switches? Isn’t that a bit slow for just going straight? It’s a bit of a pain, because invariably, the car is ready to leave, but decides not to enter the intersection, as the countdown is normally on 2 by then, and there’s no extended signal. Altering the timing would help east-west service. Steve: The TTC’s whole approach to intersections is getting very frustrating with the combination of slow orders, a ridiculous (and mostly ignored) rule that streetcars should not pass each other on special work (! 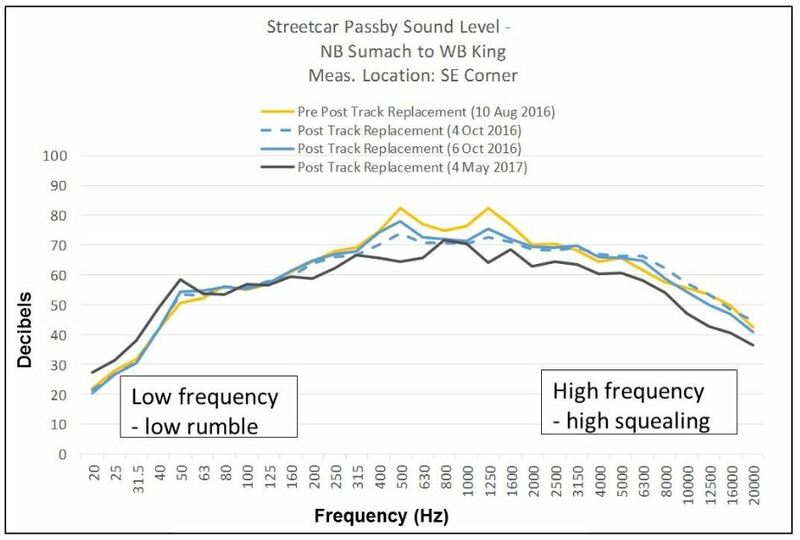 ), the noise issue, and the crying need for better signal priority, they keep hobbling operations and then complain about “slow” streetcars. On a route like King with many intersections, all of this has an effect as regular riders know, even if they are unfamiliar with the technical details. Ed wrote I hope that at the meeting someone explained decibels and frequency in terms of human hearing. In an understandable way. And that the public cared to understand. I hope someone explained it but… Remember those vehicle fact sheets the TTC used to publish for the subway cars and streetcars that had a good amount of technical information? I was talking about those with a couple of other people a few weeks ago and they haven’t put out anything like that in many years. None of us knows why but there’s a suspicion that the TTC thinks the average person on the street isn’t smart enough to understand that stuff. If that’s the case, they probably did one of their “good news” style over substance presentations. So, to add to what Ed wrote, under most circumstances, a 10 dB increase or decrease is perceived as a doubling or halfing of loudness respectively. Another useful one to know is that 3 dB increase or decrease is approximately doubling or halving of power. One implication is that for sound reproduction is that to get twice the loudness out of a speaker, you need to feed in 10 times the power. Going from a 10 watt to a 100 watt amplifier will double the volume. Going from 10 watts to 20 and trying to get double the volume with only a 3 dB power increase typically results in disappointment and equipment damage. Did anybody at the meeting mention what the Y axis on the charts was measured in though? “Decibels” as you mentioned is just a ratio. 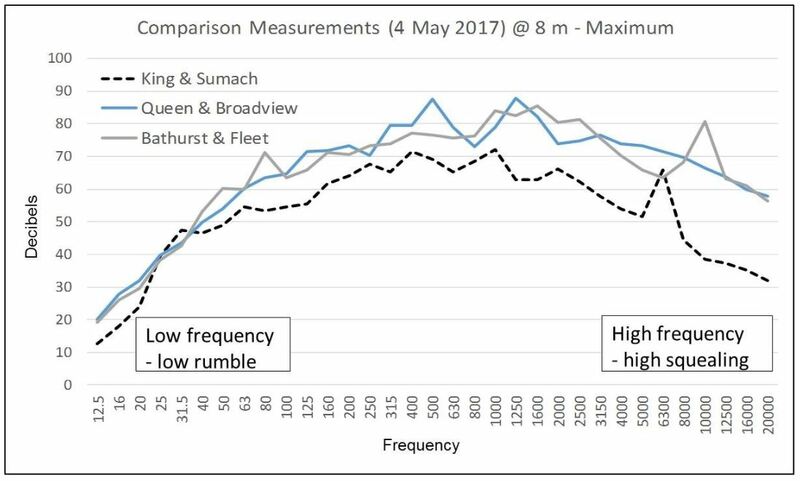 Without a reference value that the measurements are with respect to, it’s a chart that has “more loud” and “less loud” without anything quantitative to pin it to. I’d assume these are dB SPL measurements, but that might not be correct, and if they are, was any weighting used? I looked at the PDF on the website and it doesn’t specify elsewhere in the text. There are different implications for some areas on those charts if they’re unweighted or even dB(C) vs. dB(A). If I was grading that presentation PDF, I would’ve come down severely on how the test methodology and results were documented. Steve: I agree that it was a poor presentation, and the methodology is sloppy. At the very least, readings should have been broken out by vehicle type so that the very different spectra of the new and old cars were clearly shown. This would actually have helped the TTC’s argument that the conversion to new cars would solve a lot of the reported problems. Anyone who wants a detailed description of the technical issues of sound levels and perception should read any of the technical appendices to the GO Electrification TPAP, for example the section for the USRC. Look at Appendix A starting at page 73 of the pdf. That said, I don’t think the people at this meeting were interested in a detailed scientific explanation. My concern is that when this presentation finds its way to higher powers, the holes in it could undermine credibility with politicians who may well intervene. The TL;DR of discussing the presentation materials would be: the graphs, to someone unknowledgable, would show a minor decrease of Noise, from 80 Noises to 70 Noises, which is only a 15% reduction, and not anything to write home about. (As if 80 short-turns are down to 70: a little better, but hardly a solution.) Whereas really the perceived noise has been cut in half, and the building-shaking energy is down a significant amount too, at certain frequency ranges. Obviously if the presenters had put some thought into the presentation, and gotten some technical advice (or even checked Wikipedia), the graphs would be laid out differently and would show a dramatic reduction in noise. You seem to have missed the point that it is a logarithmic scale, not a linear scale. The reduction is by a factor of 10 on the power level and a perceived halving of noise. This is far better than 15%. Thank you TTC passenger for giving a detailed explanation about the different types of sound scales. Residents also need to account for the fact that any noise would happen within a small band of time with large gaps of silence in between. Why just this evening at 11pm, all 5 scheduled 514 cars were traveling eastbound within a 9 minute band between Parliament and John when on paper they’re on a 15 minute headway. Why just this evening at 11pm, all 5 scheduled 514 cars were traveling eastbound within a 9 minute band between Parliament and John when on paper they’re on a 15 minute headway. Ah, route management at its best! Steve: Line management indeed. The 514 is often a shambles and there appears to be no attempt to maintain a reliable headway to Distillery Loop. Those cars are just King extras as far as many at the TTC seem to be concerned. I have ridden car 4403 a few times in the past few days. It has a wheel squeal issue as it travels and it turns into a loud groan sound when braking. Are the early Flexities already showing their age?